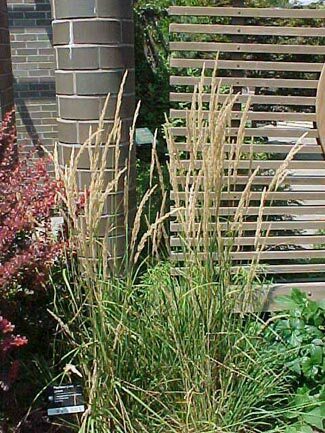 'Karl Foerster' is a hybrid feather reed grass cultivar which is valued for its early bloom, vertical lines and ability to grow in wet soils. 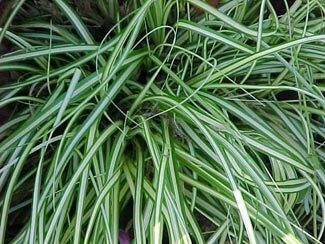 It is a slowly-spreading, clump-forming, cool season ornamental grass which features an erect, slightly arching, slender clump of narrow, stiff, rich green leaves growing to 3' tall and 2' wide. Leaves produce little fall color, eventually turning tan in winter. In June, tightly-vertical flower stalks rise well above the foliage to 6' tall bearing narrow plumes of feathery, purplish-green flowers which turn golden as the seeds mature in summer and eventually tan. 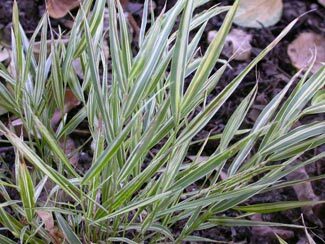 'Overdam' or Variegated Feather Reed Grass is a clumping plant similar to 'Karl Foerster', but with striking white variegation. It blooms late fall. Foliage reaches 1-1/2", plumes 5 feet. 'Evergold' is a dense, clump-forming sedge rising to 10" tall and to 20" wide which is grown for its foliage effect. Features grass-like, arching, variegated leaves (1/2" wide to 12" long) which are creamy yellow with dark green borders. 'Ice Dance' is a versatile sedge that can be planted in sun or shade. Bright white variegation runs along the edges of half- inch wide leaves. Thrives in moist soil, but also does well in average garden soil. Soil must not be allowed to dry out, however. Cut back to the ground in late winter. May benefit from a winter mulch. ‘Aureola’ is a golden-striped form of Hakone grass. 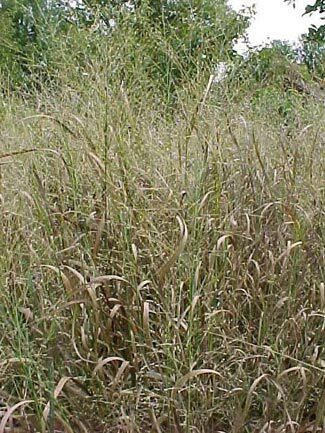 It is a rhizomatous, deciduous perennial grass that typically grows in dense spreading clumps to 15” tall and features gracefully arching green leaves variegated with gold longitudinal striping. Yellow-green flowers appear in loose, nodding panicles in mid-summer. 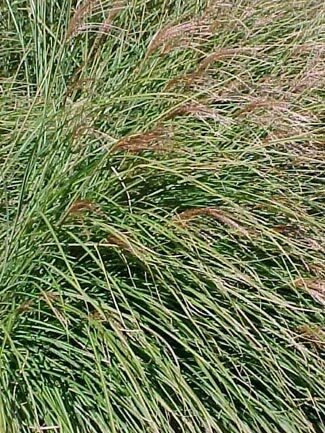 Japanese bloodgrass is a clump-forming, ornamental grass which features erect, thin blades (1/4" wide) typically growing 12-18" tall. The upper half of each blade turns a garnet red in summer with the red color often deepening toward burgundy as the growing season progresses. Grass remains attractive until late autumn and then goes dormant in winter. Rarely, if ever, flowers. The 'Big Blue' cultivar is a tufted, grass-like perennial which typically grows 12-18" high (sometimes to 2') and features a clump of strap-like, arching, glossy, dark green leaves (1" wide). The 'Variegata' is similar growth habit to 'Big Blue' but with creamy white variegation to the leaf edges. Clumps slowly but does not spread aggressively. Erect, showy flower spikes with tiered whorls of dense, lavender flowers rise just above the leaves in late summer. 'Spicata' is also known as creeping lilyturf. Its slender green leaves spread which makes it good for preventing soil erosion. All varieties have flowers that give way in fall to blackish berries which often persist into winter. Easily grown in average, medium, well-drained soil in full sun to part shade. Prefers moist, fertile soils in part shade. Tolerates wide range of light conditions and soils. Also tolerates heat, humidity and drought. Mow in early spring to remove old foliage. Miscanthus 'Gracillimus' is noted for its narrow green leaves with a silver midrib which form a substantial, rounded, arching clump of foliage typically growing 4-6' tall (to 8' when in flower). Foliage turns yellowish after frost, but quickly fades to straw-beige by winter. Tiny reddish-copper flowers appear in tassel-like inflorescences above the foliage in late September, gradually turning into silvery white plumes as the seeds mature. Blooms later than most Miscanthus cultivars. Miscanthus 'Purpurascens' is an erect clumping grass that has reddish-purple leaf tips. In early fall, the magenta blooms turn white and the foiliage turns vivid reddish orange. Miscanthus 'Strictus' is best known for the unusual horizontal yellow bands on its foliage, erect growth habit and upright foliage. Reddish fan-shaped seed heads appear in September. Miscanthus 'Variegatus' has rich white stripes that run the length of the leaf. Red blooms emerge in September. Miscanthus 'Yaku Jima' will grow three feet tall and holds it flowers tight in the foliage. Miscanthus flower plumes persist well into winter providing good winter interest. Easily grown in average, medium, well-drained soil in full sun to part shade. Tolerant of a wide range of soils from well-drained sandy soils to the heavy clays. Prefers moist soils. Best in full sun. Less vigorous with decreased flowering and tendency to flop in too much shade. Tolerant of summer heat and humidity. Clumps slowly expand in circumference by short rhizomes, but retain tight clump shape. Foliage should be left standing throughout the winter for visual interest and to provide protection for the crowns. Substantial clumps tend to flop (or totally collapse when subjected to heavy winter snows), and will often benefit from some support. Cut foliage to the ground in late winter just before new shoots appear. Panicum 'Heavy Metal' is well-known and used widely for its blue foliage and extreme erect habit. This plant looks great as a specimen or in masses. Panicum 'Rotstrahlbusch' is a red switchgrass that grows to about two feet and has wonderful fall color. Panicum 'Shenandoah' is a spectacular switchgrass! Its red tipped foliage is nice during the growing season and becomes dazzling in the fall. Easily grown in average, medium to wet soils in full sun to part shade. Tolerates wide range of soils, including dry ones, but prefers moist, sandy or clay soils. Tends to flop in rich soils. Generally best in full sun. Will grow in part shade, but begins to lose its columnar form in too much shade, growing more openly and possibly falling over. Grows primarily in clumps, but may infrequently spread by rhizomes. Cut back clumps to the ground in late winter to early spring. Pennisetum alopecuroides has a clumping, tuft-forming habit. Rose-colored bottlebrush plumes appear in midsummer and turn almond color in late fall. Pennisetum 'Hameln' has the same look as alopecuroides but only grows to two feet with plumes. 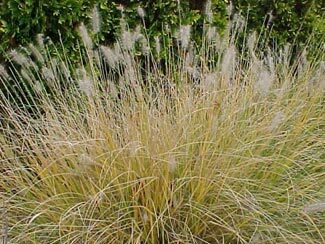 Pennisetum 'Little Bunny' is a clumping grass with one-inch plumes and ten-inch green foliage. Looks great in rock gardens or as a groundcover. Pennisetum 'Rubrum' has striking deep purple foiliage all summer and purple plumes appear in early fall. This plant is an outstanding container plant due to its bold color; however it is considered an annual in our area. Fountain grass is a warm season ornamental grass which typically grows in graceful, spreading clumps from 2-3' tall and as wide. Features narrow, medium to deep green leaves (to 1/2" wide) in summer, changing to golden yellow in fall and fading to beige in late fall. Foliage usually remains attractive throughout the winter. Showy, silvery to pinkish-white, bristly, bottle brush-like flower spikes arch outward from the clump in late summer like water spraying from a fountain (hence the common name). Flower spikes turn brownish as the seeds form, and spikes usually persist until late fall or early winter before shattering. 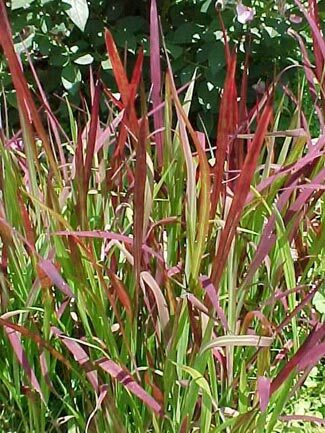 Many excellent fountain grass cultivars are available in commerce, ranging in height from 1-5' and featuring a variety of different flower colors (purples, pinks or whites) and autumn foliage. 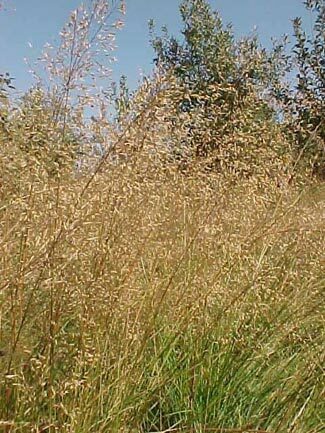 Little Blue Stem is one of the dominant grasses which grow in the rich and fertile soils of the tallgrass prairie. 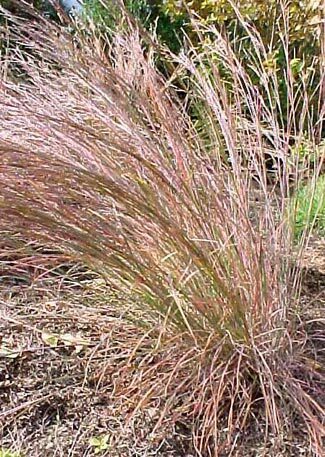 It is a warm season, ornamental grass which typically grows 2-4' tall (less frequently to 5') and occurs in prairies, open woods, clearings, glades, roadsides and waste areas. Forms upright clumps of slender green leaves (1/4" wide) with a tinge of blue at the base. 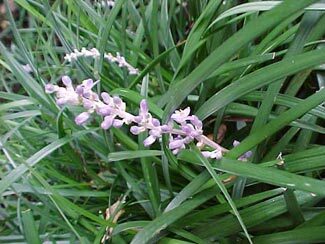 Purplish-bronze flowers appear in 3" long racemes on branched stems rising above the foliage in August. Resulting clusters of fluffy, silvery-white seed heads are attractive and may persist into winter. Most outstanding feature of this grass may be the bronze-orange fall foliage color. Prairie Dropseed is a clump-forming, warm season, perennial grass which occurs in prairies, glades, open ground and along railroads. Fine-textured, hair-like, medium green leaves (to 20" long and 1/16" wide) typically form an arching foliage mound to 15" tall and 18" wide. Foliage turns golden with orange hues in fall, fading to light bronze in winter. Open, branching flower panicles appear on slender stems which rise well above the foliage clump in late summer to 30-36" tall. Flowers have pink and brown tints, but are perhaps most noted for their unique fragrance (hints of coriander). Tiny rounded mature seeds drop to the ground from their hulls in autumn giving rise to the descriptive common name.